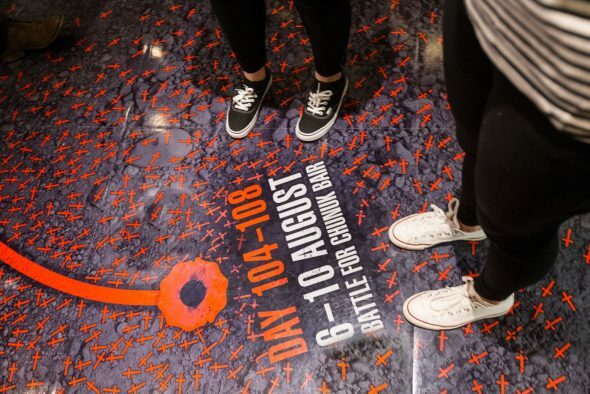 20 October marked a significant milestone at Te Papa when Gallipoli: The scale of our war’s one millionth visitor and a friend were escorted through the exhibition. That number is almost equal to New Zealand’s population (1.1 million) during the war, 100 years ago. We’ve reached this phenomenal figure in just 18 months since the exhibition opened. That’s a fair proportion of New Zealand’s population today of around 4.6 million (although many visitors of course have come from overseas). The floor design in the exhibition. Photo by Norm Heke, Te Papa. Te Papa, Weta Workshop and our other partners involved in the creation and development of the exhibition are proud yet humbled by this extraordinary response. 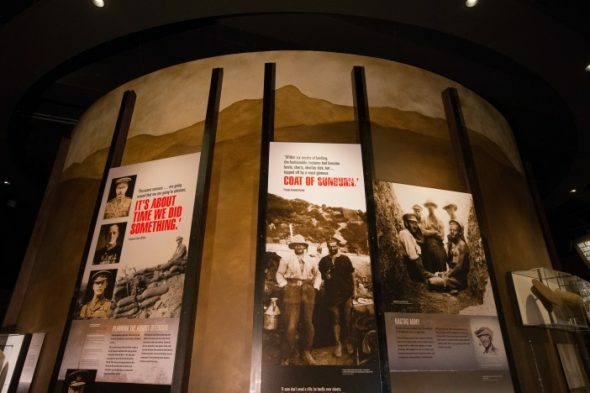 Of course, it’s not just about statistics – we also care very much about the quality and depth of each individual’s experience of Gallipoli and the myriad meanings that have been made from exhibition. 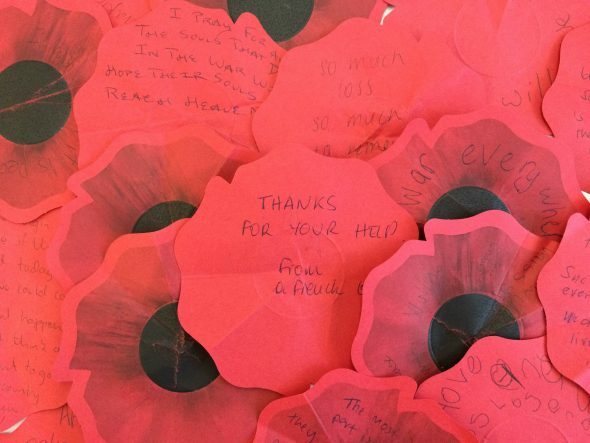 With this mind, I thought I’d write about what the First World War has meant to me, and the directions I have taken as a history curator while working on this topic at Te Papa. My direct work as a curator on Gallipoli was concentrated in a very intense period of around nine or ten months, although the trajectory towards the exhibition took place over a longer period when lots of conceptual thinking was undertaken by a wide team. I have spoken about this in some of the ‘Building Gallipoli’ videos produced by Weta Workshop. Example of wall treatment in the exhibition. Photo by Norm Heke, Te Papa. My work on the exhibition continues, although not on a daily basis like Te Papa’s hosts, exhibition maintenance teams and others – but in regular tours, talks and research. Lately for example I have been writing about why New Zealand DID NOT set up a war museum like Australia or Britain. However – and it seems like such a long time ago now – I first started thinking about the commemorations in 2008, at the time of the 90th anniversary of the Armistice. It was then, after reviewing exhibitions at Archives New Zealand and the National Library, that I started to reflect on Te Papa’s history collections. I wondered how they could interpret the next significant anniversary of this major 20th century event. I was also searching for a way into the war that resonated with me personally as a history curator and a social and cultural historian. By chance this was soon enabled by the acquisition of a range of very idiosyncratic artefacts. These helped to shape and broaden my definition of war-related artefacts and how they were implicated in New Zealanders’ experiences of the war – on the battlefield and at home. It was this doll (below), whom we refer to fondly as ‘Woollen Wyville’ that opened up my eyes to broader definitions. Wyville stands about 30 centimetres high and was probably made around the outbreak of the war. He was crafted by Greymouth woman Dorothy Broad, to stand in for her sweetheart Wyville Rutherfurd, who left with the Main Body of the NZEF in October 1914. The clue to the doll’s identity is his cap badge – its the same as the one that would have been attached to Wyville’s cap. I was also taken by his tiny paper wrist-watch – did Wyville have one to tell the time while he fought on Gallipoli and then on the Western Front? This acquisition was followed by another doll related to Dorothy and Wyville. This one was a tiny soldier doll made from a chicken wishbone. After looking at historical newspapers I worked out that it was a rare example of the type that Dorothy and her sister had made and sold to raise funds to buy tobacco for New Zealand troops. The other items that came in were more perplexing. These were remnants – flashes, medal ribbons, buttons and other insignia from a soldier’s uniform. Eventually, after consulting books about uniforms and poring over military personnel files, I deduced that most of these had been removed from Wyville’s uniform. It was moving to think about Dorothy receiving her dead sweetheart’s uniform, and then her gradually cutting it down to the basic elements of Wyville’s military identity. But I was also taken that she had also transformed a tunic button and a shoulder ‘pip’ into hat pins: small military objects became personalised items of mourning jewellery (below). These remnants also pointed me towards Wyville’s war – the campaigns in which he participated, the circumstances of the award of a Military Cross, his role in the secret operations of ‘Dunsterforce’ in Persia, and the details of his death a few weeks short of the Armistice. Taken together, these artefacts materialised the myriad and multiple meaning of the war for me. They personalised its impersonal and industrialised scale and gave me something to hold onto literally and conceptually as a curator and historian when at times it seemed almost too immense to comprehend. Many thanks to Marianne Abraham and her extended family for sharing Dorothy Broad’s story and these special objects she made and saved. The story of Dorothy Broad and Wyville Rutherfurd is in Kate Hunter and Kirstie Ross, Holding on to Home: New Zealand Stories and Objects of the First World War (Te Papa Press, 2014), pp. 216-7.